From the mind of George R.R. 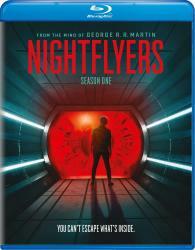 Martin, comes the psychological thriller Nightflyers. On the eve of Earth's destruction, a crew of explorers depart on the most advanced ship in the galaxy, The Nightflyer, to intercept an alien spacecraft that might hold the key to their survival. As the crew nears their destination, they discover the ship's artificial intelligence and never-seen captain may be steering them into deadly and unspeakable horrors deep in the outer reaches of space.